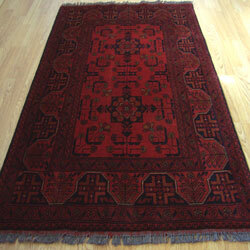 Afghan rugs, are handwoven, mainly in Afghanistan but many are made by Afghan refugees in areas like Pakistan & Iran. Afghan rugs offer a charming focal point and a good cause for conversation, you will never know the exact origins or history of each piece, i.e. where it was made or under what circumstances but each rug will have an interesting history. Afghan rugs are handmade from 100% wool, the wool is dyed using various vegetable dyes and other natural dyes that are rich in colour. We stock two designs Aqcha named after a quaint village in northern Afghanistan which is based on the octagonal elephants foot print design & Khan originally made in northern Afghanistan this design is mainly geometric and was inspired from the soviet invasion of Afghanistan in 1979. Afghan rugs are non specific and no two pieces are identical but we make every effort to make sure each rug sold is as near as possible to our base images.